A close-up portrait of children caught up in the Syria conflict. It brings together poems, pictures and stories from young people living in a Syrian refugee camp in Lebanon. Deeply moving and, because of the resilience and optimism of the children themselves, ultimately inspiring. Proceeds go to FSWL charity. Amazing book and amazing author. She should be so proud. A great book which highlights the wonderful human lives of children caught up in a terrible conflict. All proceeds going to charity is also humbling. Deeply emotional stories from amazing children. Very beautiful and delicately written. This book is truly inspirational and is a real eye-opener, displaying the personal stories of children living in Syria to this day that aren't broadcasted on the news. The literature written by Molly is just so beautiful and emotionally loving. 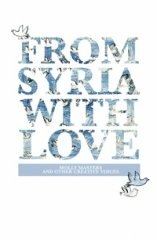 I thoroughly believe this book should be granted all the recognition that it so dearly deserves, to ensure that more people are aware of the effect for children over in Syria. Powerful, insightful, great way of raising awareness in our current time! i think everyone should have a copy of this book! Through the messages of these children, a certain degree of sense can be brought back into the world. It's a wonderfully collated book with powerful contributions from young people who have suffered more than most of us do in a lifetime. This is a book that needs to be read the world over. It would be amazing to see the voices and stories of these children projected and heard by even more people, and to be recognised by a prize like this for their inspirational value and beauty.